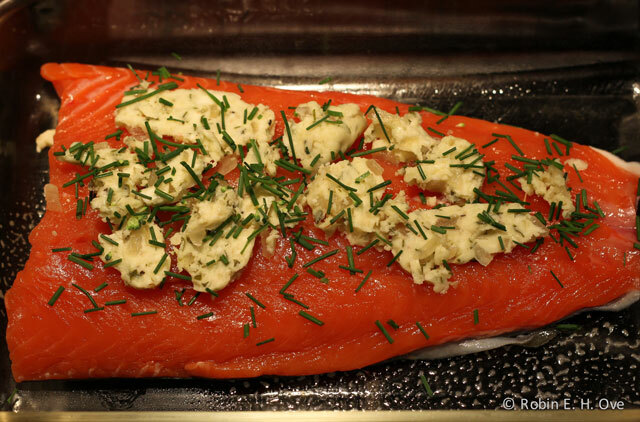 Salmon with Compound Butter and Chives - What about the food? A time proven way to kick up the flavor of fish, seafood and meats is to create a compound or flavored butter infused with herbs and spices and applied in either the cooking or finishing processes. Taking some time to make ahead you can store the results in the refigerator for a week or freeze for later. 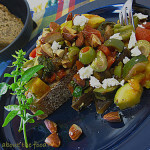 But even for a quick weeknight meal the preparation time is minimal, though I believe making ahead and chilling give the flavors time to meld. I tried out this version from Lidia Bastianich from her book, Lidia’s Italian-American Kitchen included with the recipe, Shrimp Prepared in the Scampi Style (which is incredible by the way.) What I liked particularly is that the garlic and shallots are sauteed in olive oil and wine before adding to the unsalted butter and herbs. This gave a more delicate almost velvetiness to the flavors instead of the usual sharp brigthness of the genus Allium (onions, garlic, leeks, shallots, chives etc.) is known for. For my base compound butter I left out the parsley and tarragon listed in the orginal recipe so I could mix up the herbs and spices as my mood and the meal suites. 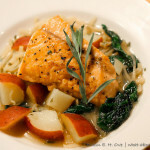 This is a really quick meal that is really a wonderful mid-week treat or special enough for company maximizing fresh in-season salmon and ready-to-go flavored butter. 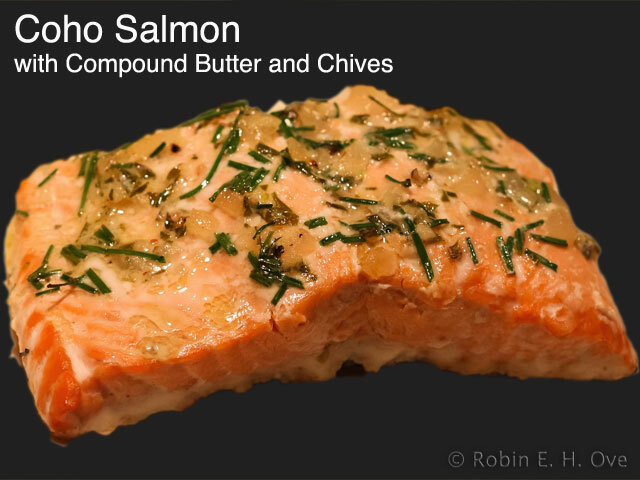 An adaptation of a flavored butter recipe found in Lidia's Italian-American Kitchen, 2001, Lidia Matticchio Bastianich to flavor fresh salmon. In a small skillet, saute garlic in olive oil over medium heat until it just changes color to just golden. Add shallots, season with salt and pepper and cook until translucent, about 2-3 minutes. 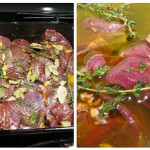 Add the wine, bring to a boil and cook until it is reduced by half. Add softened butter and mix together thoroughly. Lidia suggests that you then your shape butter into logs on 12" plastic wrap, roll it up and refrigerate for several hours or up to a few days. Makes it easier to slice just what you need later on. 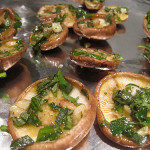 Top with 4 tablespoons of the flavored butter and sprinkle with fresh chives. Bake for 15 minutes until fish flesh is opaque and serve with lemon wedges. Save the remaining compound butter wrapped in plastic in the refrigerator for up to a week. Good on steak as well. Duck Tales — Pick your ending! 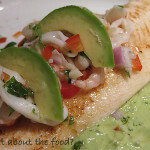 Beautiful fish and beautiful blog redo! And scampi was always a favorite, one of thoes magical dishes I even ordered when I was a kid whenever we went to a seafood restaurant. I love the idea of the compound butter that can be added to whatever when the mood strikes. So much more work to do here, a bit like house construction but without the floor scraping Jamie! What an unexpected surprise! Fun new look! Really enjoying your posts and pics. Hope to see you in SF-Oct-Kate? Thanks for checking out the preview. This site is still under construction, more to come. Looking forward to a visit in Oct. just working on the details. What fun!